Our readings this Sunday focus on the human condition of suffering, the healing power of God and our response to it. In our first reading (Job 7:1-4, 6-7), we hear part of Job's lament of his suffering. In a sense, Job mirrors all of human suffering and tries to understand it. It is a lament that could often be heard today. Job spoke, saying: Is not man's life on earth a drudgery? Are not his days those of hirelings? He is a slave who longs for the shade, a hireling who waits for his wages. So I have been assigned months of misery, and troubled nights have been allotted to me. If in bed I say, "When shall I arise?" then the night drags on; I am filled with restlessness until the dawn. My days are swifter than a weaver's shuttle; they come to an end without hope. Remember that my life is like the wind; I shall not see happiness again. In our Gospel reading (Mark 1:29-39), we hear of the suffering multitude flocking to Jesus for his healing touch and Jesus responds as only God could respond. We hear about the tender moment of Jesus grasping the hand of Simon's sick mother-in-law. He helps (raises) her up. 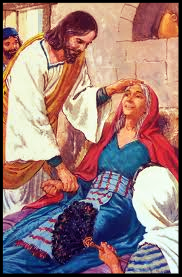 Her response to Jesus' healing touch is to get up and offer her service to the Lord. On leaving the synagogue Jesus entered the house of Simon and Andrew with James and John. Simon's mother-in-law lay sick with a fever. They immediately told him about her. He approached, grasped her hand, and helped her up. Then the fever left her and she waited on them. In our Epistle reading (1 Corinthians 9:16-19, 22-23), St. Paul provides us a model of how we are to live our life of service to the Lord - freely, without recompense. His is an obligation, imposed upon him the Jesus himself. His servitude to the people and to the Lord is the essence of his freedom. Even in the midst of the "drudgery" of our lives and all of its suffering, we know that Jesus has already healed us of the ultimate human condition - the slavery to sin. By his sharing in our suffering, he has "raised us up" to new life through our Baptism. Our response, our obligation, is to get up and live our lives in service to the Lord and to others. As St. Paul tells us in today's Epistle, therein lies our freedom.